2012 Aug 18 & 19 Woody’s Menagerie hauls wild animals to the Kenai Peninsula State Fair, held in Ninilchik, Alaska under the name “Lions, Lemurs and Bears, Oh My,” from the Lower 48. 2011 July 19 Woody’s Menagerie Animal Show returns this year with something new: a full slate of barnyard races. Watch speedy pigs, goats and sheep as they vie for the title of fastest animal at the fair on Monday through Thursday, July 25-28. Woody’s will also present its newest menagerie addition, a large cat display featuring an adult liger (lion/tiger hybrid), white tiger, golden tiger, adult male lion and baby male lion that people can view and photograph up close. 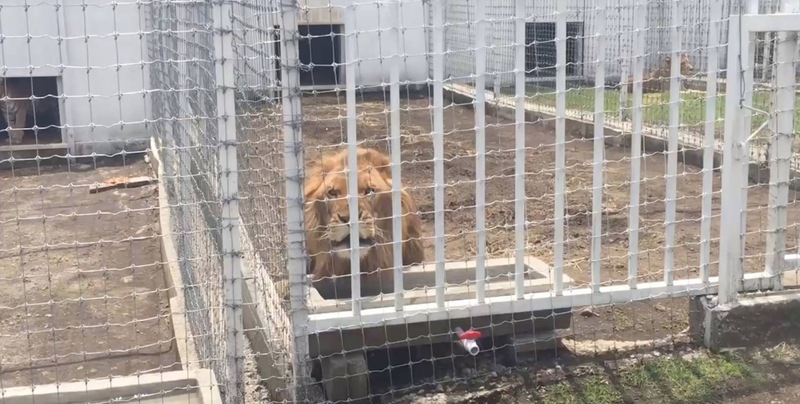 No decent facility breeds ligers or takes big cats out to fairs. COLUMBIA – Lions, and tigers, and bears — and ligers. That’s right. Ligers, a combination of a tiger and a lion, are real animals and were the centerpiece of Woody’s Menagerie Animal Show at the Boone County Fair. The show has all of the above, plus a macaque monkey, a skunk, an armadillo and more. Gregg and Karen Woody own and raise exotic and farm animals at their 42-acre home in Mulberry Grove, Ill. The Woodys contract out their personal menagerie as a means to pay for the upkeep of the animals. “We are a nonprofit but not on purpose,” Gregg Woody joked. Woody’s Menagerie has traveled to 14 fairs this summer with four more still to go. At the Boone County Fair, the exotic animal show, usually led by Gregg, runs through Thursday night. Gregg announces the animals and tells the audience a little about each of them as they are brought out. Gregg said they rotate the animals based on each animal’s attitude, the heat and Gregg’s mood each show. Most of the animals wait in cages in an air-conditioned trailer between shows. The big cats are left in wire cages under a tent, with cooling fans pointed in their direction. For some, the heat might raise concern for the animals, but Karen said she is not worried. Speedy, a three-banded armadillo. Speedy curled into a ball until he was placed on the dusty ground, at which point he took off, almost making it under the fence, and the audience could see how he got his name. A skunk named Flower Junior. “They say skunks are the best pets you could ever have,” Karen said. Skunks, she said, are trainable and loveable. Cody the 6-month-old grizzly bear. When Cody was born, he weighed 6 ounces, but now he weighs almost 100 pounds. Each morning, Cody must be walked. Once, a man drove himself into a ditch as he did a double take when he saw a bear on a leash, Karen said. Then ligers came out to play. First came Tabitha, who was born in December and is still fed a bottle twice daily. Tabitha still has all of her distinctive stripes, but as she gets older, most of those will fade. She will eventually grow to be 700 to 800 pounds, Karen said. Then her 3-year-old big brothers, Tank and Charlie, made their impressive appearance. Both males are a muted tan color, with faint stripes and spots. They eat about 20 pounds of meat a day. These animals currently weigh about 750 pounds each and still have two years of growing before they reach full maturity. They could end up weighing around 1,100 pounds. Tank and Charlie lazed around the enclosure, playing with a ball or licking their paws. On occasion, someone in the crowd would catch their eye, and they would playfully pretend to be stalking prey from behind the fence. The brothers were also featured at the Boone County Fair in 2009 when they were about 6 months old. The Woodys also brought along a Tabby Tiger, a lion named Mikey and two 9-week-old lion cubs. Colin Lea, 4, watched the show with his parents and younger brother, Quentin. He said the ligers were the best part and thought they were really big. “Would they bite if we touch them?” he asked his mother, Liz. Ligers are undoubtedly rare creatures. 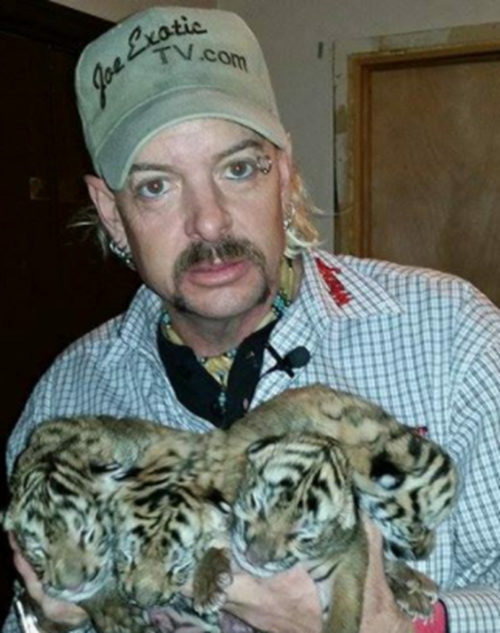 Tank, Charlie and Tabitha were bred in the menagerie from a tigress and male lion that were in the show 12 years ago, Gregg said. “We put them together and thought, if it happens it happens,” he said. The pair was together for eight years before they produced their first litter. Tank and Charlie are the first males born to the pair. Gregg said that to his knowledge, all ligers in the United States under 8 years of age came from his cats. “In this business, if you screw up and you’re lucky, you get to do it again,” Gregg said. Gregg started out with wildlife about 30 years ago and got his first big cat more than 20 years ago. The Woodys also offer an extensive petting zoo, barnyard racing, a reptile exhibit and camel rides. Gregg described the various workers at each show as “friends, families and a few volunteers.” Some volunteers travel with the show; others are picked up at each location. The cages, especially with the big cats, are guarded 24 hours a day. Gregg said in the 20-something years he has exhibited big cats, he has never had an accident involving the public. At each location, Gregg estimates that hundreds of people ask to get closer to the animals, but contact is not allowed. He said the animals are not necessarily trained, but they are raised from birth to participate in the shows. “You teach them right from wrong when they are younger,” he said. A traveling menagerie is time-consuming and expensive. Karen and Gregg have been married for 20 years and have had one four-day vacation in that time.